This article submitted by Linda Stelling on 8/9/00. At the end of July, Dr. Jennifer Eckmann began working with her husband, Dan, in his dental practice in Paynesville. A native of Detroit Lakes, Eckmann completed her undergraduate work at the University of Minnesota-Morris and her dental degree at the University of Minnesota- Minneapolis. She has worked in St. Cloud since graduating from college. 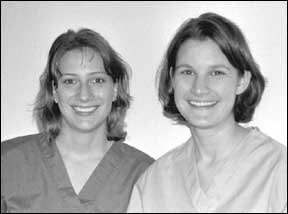 Jody Meagher (left) and Dr. Jennifer Eckmann (right) have started working in Paynesville. A native of Melrose, Jody Meagher will be working with Dr. Jennifer Eckmann as a registered dental assistant. The two have worked together a year. Meagher is a graduate of Central Lakes College in Brainerd. Their goals are to get to know the Paynesville community better and to serve their clients, Dr. Eckmann said. Dr. Jennifer Eckmann will be at the Paynesville Dental Clinic on Mondays from 9 a.m. to 5 p.m. Dr. Dan Eckmann is at the clinic Tuesdays and Thursdays, 8 a.m. to 5 p.m. They also enjoy spending time outdoors. Dr. Eckmann's interests also include fishing, reading, playing the piano, and water skiing. Meagher's include spending time with her family and waterskiing. Her husband, Casey, is in law enforcement.